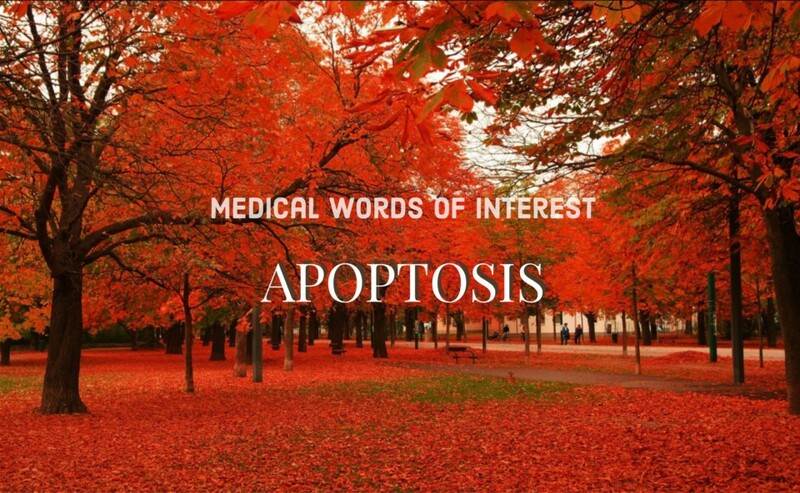 I loved the word APOPTOSIS when I first heard it applied to cancer treatment. It was the aPOPtosis pronunciation that caught my attention as I imagined cancer cells exploding from chemotherapy and champagne corks aPOPing in celebration. I was so wrong. I still love the word, but its meaning is far less dramatic than I initially thought. Its Greek origin is obvious, but the proper pronunciation erases its onomatopoetic oomph. If the second “p” is silent, as it should be, then the emphasis changes and the word loses all its drama; a-POP-tosis becomes AP-o-tosis. A kinder, gentler, more measured sounding word. The Greek translation of the word is that of falling leaves. When I drive through New England in autumn, I never think what a splendid apoptotic spectacle nature puts on for leaf peepers. Now I probably will invoke that thought. But the yearly, programmed death of tree leaves is an extraordinarily apt metaphor for the efforts of chemotherapists to stop the growth and spread of cancer. In many parts of the body cells die naturally and are replaced by newer versions. Simply put, cancer is a pattern of cell growth and death that has gone terribly awry. Cells either fail to die naturally and/or grow uncontrollably without normal guard rails to ensure their assigned and specialized functions. The goal of newer cancer treatments is to smartly reprogram the abnormally growing cancer cell to its natural death cycle and to set them again on their slow, normally prescribed death march. Autumn becomes their final season. This is done by exploiting complicated molecular, metabolic, and genetic factors to challenge the cancer cells’ newly acquired and misguided attempt at immortability. Apoptosis is normal programmed cell death. Falling leaves and autumnal death are the newest cancer treatment tropes, embodied in a single yet fascinating word.